This book has provided literally hours of fun in my house. Both of my kids are "plushy" fiends. Of course they love the traditional stuffed animals, but they are also big Uglydoll fans. I was given this book at last spring's Quiltmarket by the lovely and gracious Suzanne from Stash Books/C&T. When I saw it, I actually think I gasped out loud, telling her how much my kids would love it and she gave it to me. Needless to say, that only added to my love Quiltmarket. 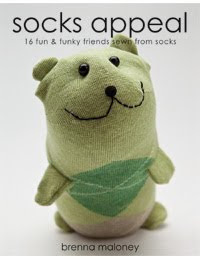 The book is titled "socks appeal" and is a how-to book for making all kinds (16 different) sock creatures, written by Brenna Maloney. The projects range from very easy, like a snake, to pretty challenging, a mermaid or octopus! Of course, having made sock puppets before, my kids just chose right from the middle. We decided on the Hamster project and cheerfully went to Target to find some "cool" socks. We found all kinds of socks, for really reasonable prices, so we got a few pair. The best thing about Target is that they usually have holiday themed ones too. The photos in the book that guide you along the steps to making the creatures are very helpful. They are up close, and show what you actually need to see examples of. I really enjoyed Brenna's conversational writing style. It lent itself well to the overall "fun" feel of the book. Repeatedly, in many places, she notes that however your creatures come out, it's ok. They are meant to be unique and one of a kind. This is particularly good with children. My kids started talking about their creatures as if they were alive as soon as the eyes were attached. Unfortunately, I only have pictures of Stinky. He is my son's creation, and the first one we made. Tanner, my daughter's hamster has been loved to the point that he is lost somewhere in the wilds of her room. When he resurfaces, I'll be sure to take a photo of him, too. What I do have, are ACTION shots. Here is Stinky, longingly looking out at all the snow we've gotten...a record 55+" in the month of January alone. You can see his cute blue tail in this photo. 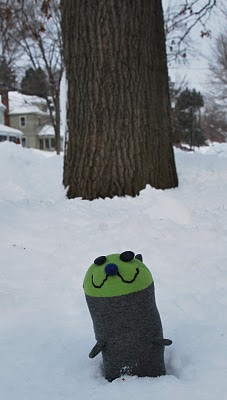 And here he is actually out in the snow. It was a quick trip, but he wanted good photos if he was going to go "public". My next post will be about my certification on the long arm quilting machine at the local quilt shop. I hope they let me take pictures! too cute! And wow! Those are some PILES of snow.